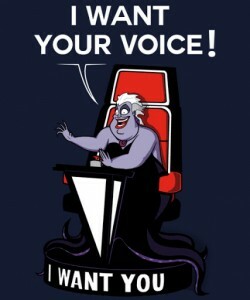 The infamous sea witch was just a judge for The Voice ahead of her time. All she wanted was to make Ariel a star! Okay, fine, maybe she’s not so magnanimous. Unless magnanimous means something having to do with her size…? Anyway, I just wanted to show you this cool T-shirt, ’cause that’s what I do. It’s a way better job than swiveling in a chair to judge a singer, am I right? Although I bet that pays more… Huh… What am I doing here, again? Excuse me while I go figure out what it takes to be a judge on The Voice. I think I can do it. I know music.